Released: 1986. Genre: 2D Platformer; Adventure. Back in 1986, before the dominance of Nintendo and SEGA, the 8-bit home computers were enjoying their heyday in Europe and the UK. All of the three major platforms had hundreds of titles now deemed as classics, but they never really came close to having an official mascot, an icon that represented them in the same way Mario does for Nintendo or Sonic did for SEGA. For myself and many others, it would be appropriate to elect a certain anthropomorphic egg for this unofficial role. With his roly-poly jumps and bright red boxing gloves, he traversed over the cartoon landscapes of 14 individual titles, gracing many popular platforms of the era. Dizzy became a popular and established brand that is still fondly remembered and honoured today. I was a big fan of these games, so I could wax nostalgia until the pygmy cows come home. However, I’m putting my egg-fancying hat down and replacing it with my critical Grand-Dizzy spectacles to take a look back at the game that started it all off, on one of the formats that significantly embraced Dizzy in those early adventuring days. 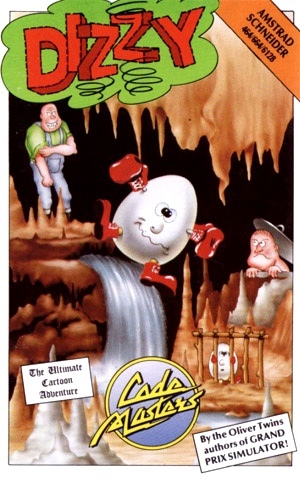 The core Dizzy series features a hero of unusual semblance, an egg with a face and an uncanny talent of platforming ingenuity, Dizzy himself. Under your guidance, he is tasked to save the various friends and lands from an ensemble of antagonists, principally the evil wizard Zaks. 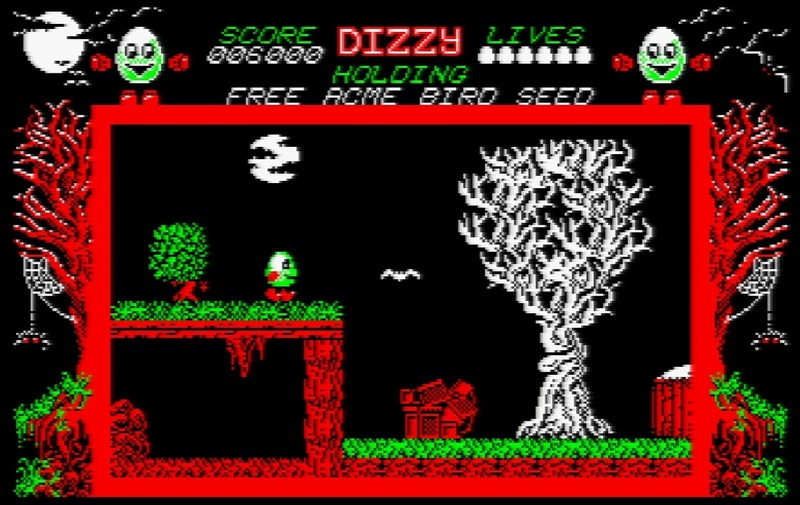 The environment that Dizzy finds himself in is a fantasy platform backdrop of tree houses, countryside, castles and caverns. In this very first adventure, Zaks has taken rule of the land of Katmandu, persecuting its inhabitants in the process and so it falls to our yolky champion to vanquish him. To achieve this you must explore the lands, solving puzzles and finding items that aid you in your ultimate goal; to create the ‘Avawiffovee’ potion to expel the tyrannical reign of Zaks. Finding the four ingredients for this mixture is no mean feat however, as a host of spiders, bats, acid rain, sharp stalactites and other nasties are on hand to hamper your quest. Put simply, Dizzy is a platform adventure game with a large puzzle-solving element. Items scattered around can be used to gain access to other locations or to defend against certain enemies. Clues are given in certain places to assist, but most of the time it’s down to you to work out what does what and where to go next. Trial and error is a big part of this game, particularly in the early stages. Another highly original aspect of Dizzy is his movement; somersaulting whenever he jumps in any direction, hence living up to his name. Hitting a landing with acute accuracy takes practice, as the amount of spins Dizzy performs can vary depending on the position of the jump or landing point. This is the most important part of the gameplay, and is an action you will have to master if you harbour any hope of beating Zaks. Some jumps require pin-point exactitude, especially in the latter stages of the game down in the caves, so performing this right is essential. This simple combination of puzzle-solving and precise jumping is part of the reason that Dizzy is so enthralling; some of the tasks are quite obvious, but others seem totally ambiguous until the penny drops. This is a clever blend that does not discourage perseverance in unravelling the harder puzzles, it merely eggs you on more to solve them (ahem!). More importantly, they are really fun to boot and very satisfying when solved, and many contain classic folklore references or comedy aspects which add to the quirkiness. Examples of both include the Garlic Clove to kill the Vampire Bats (figures!) or the Ghost Hunters Laser pack ala Ghostbusters for, yes you’ve guessed it, killing a ghost! Negotiating around the map and getting your bearings in new areas can become frustrating at times, and because you can only carry one item at a time you will find yourself going back and forth often to complete your objectives. 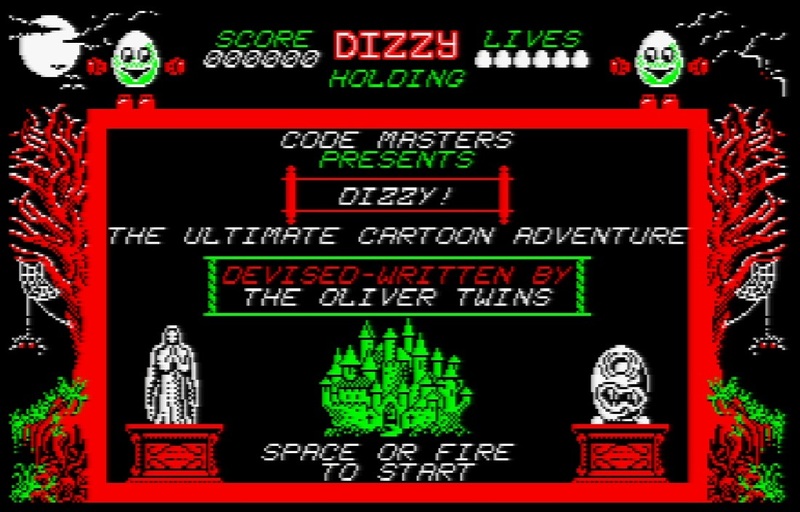 You only have one attempt starting with 3 lives, and although you can pick up extra lives during the game, these factors combined make Dizzy a very very tough egg to crack (D’oh!). Thankfully, the responsiveness is good with only a hint of slowdown in sprite-heavy areas. There are however a couple of apparent glitches. There is a part where you have to cross a bridge in a certain way; do this incorrectly and it collapses under your feet, spelling doom for Dizzy. Strangely, this bridge does not return upon your re-spawning and therefore makes the game impossible to complete. Also, if you happen to fall into a tree with a poison apple, the game will re-spawn you in the same position in the tree, thus killing you again and again. These are irritating flaws, but are avoidable with practice. 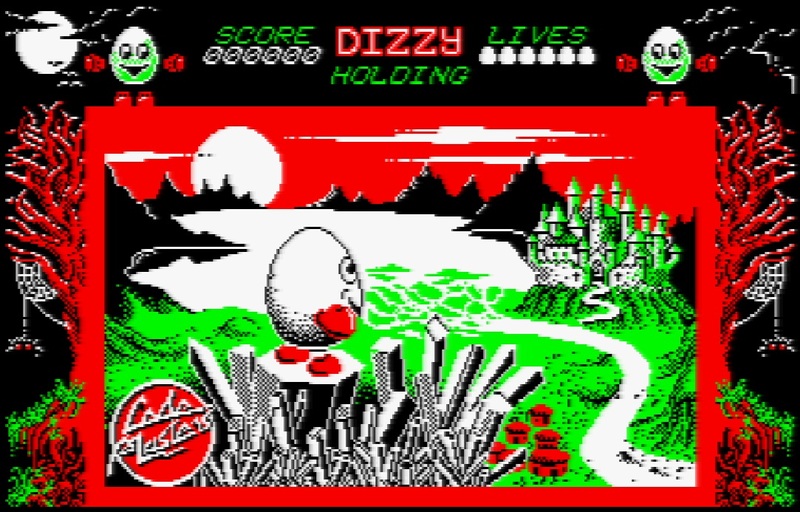 Another appealing trait of Dizzy is of course the wonderfully original trademark visuals and terrific soundtrack. 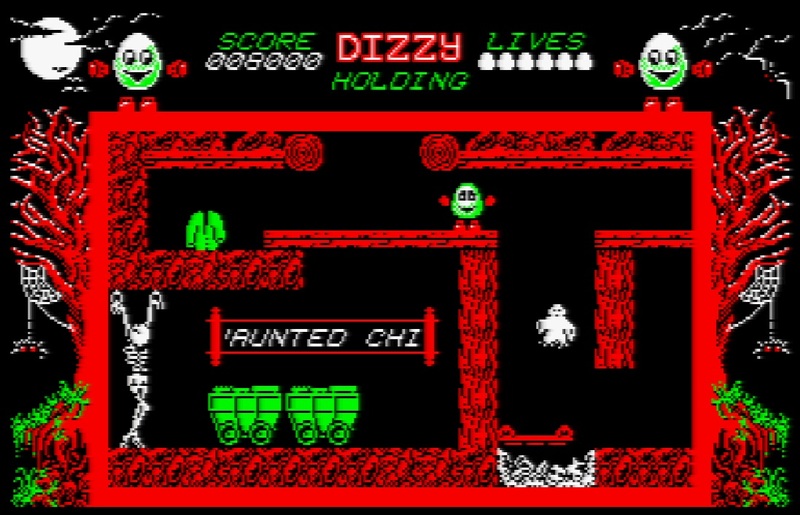 The CPC version, like the Spectrum port, opts for a high resolution display with few colours. This makes the environment look very detailed in a typically cartoon-ish manner, with lots to examine and bounce off. Only 4 colours are used and sound dull in description compared to the C64 port which utilised more colours, they are skilfully employed to make it appear there are more, and mixed well enough to keep things distinct and recognisable. 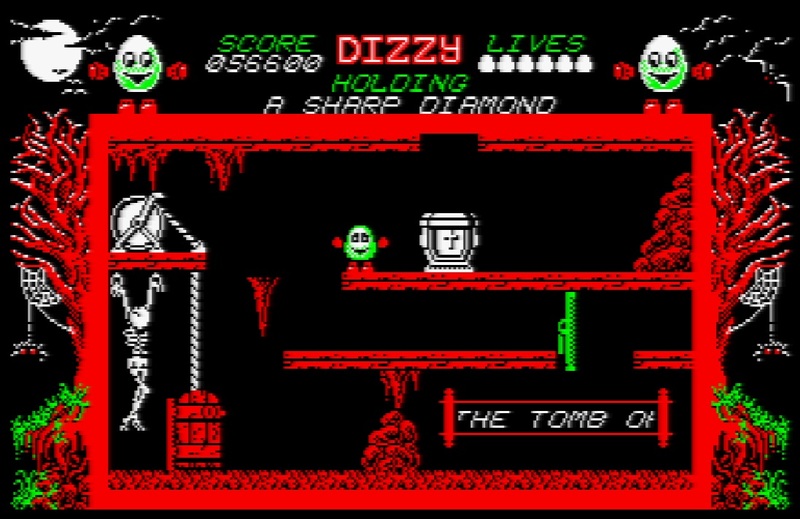 Unlike the Spectrum version, there is no colour slip, but the Dizzy sprite does tend blend in with any background images, sometimes becoming invisible for a second or so. Due to the fine animation of all sprites and the general pace of the game, this becomes rather imperceptible after a few minutes playing, but it is still annoying from time to time. The game screen is also generous in size, with some lovely detailing around the edges, and there is no hindrance in the flick screen presentation either, making for a nice fluid and pleasing game experience. 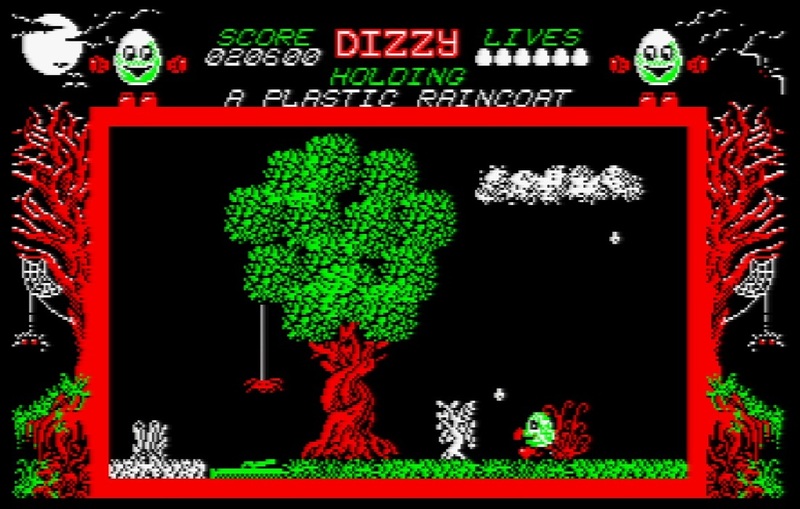 The Dizzy games possess a fine repertoire of title music and in-game tunes, and the first game certainly set that yardstick. The title screen music is a jolly, bright cartoon theme with a memorable blipping back riff and primary chiming melody, matching the mood of the game exceptionally. The in-game music is even better, providing a light-hearted but somewhat dramatic accompaniment to the action; with changes in tempo and low tones demonstrating some good use of the AY chip. The SFX within the game are limited to just a small chime when collecting or using an item, so there could have been a few more sounds included. The upshot of minimal effects is that they don’t interfere with the music, an all too common issue with the CPC’s sound capabilities. Dizzy: The Ultimate Cartoon Adventure is a landmark game without question. It started a string of successful games, crossing the chasm between home computer and console with aplomb and led the Oliver Twins and Codemasters to fame and recognition amongst the gaming fraternity. A classic cartoon idea in video game form in its truest sense, the first title in the series is not without fault, but still covers itself in renowned grandeur. With its original gameplay, high difficulty, quirky and charismatic graphical style and even more unforgettable music, this game is widely attributed as an 8-bit classic, and I’m not going to disagree. How do I like my eggs? Dizzy of course!